Simple, budget friendly, and healthy dish that you can serve to your family. 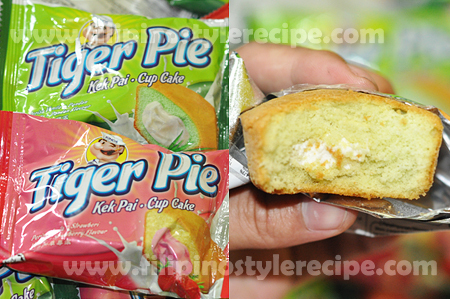 Best served with steaming rice. 1. Wash tilapia, dry, and sprinkle with salt. In a frying pan, heat oil and fry tilapia on both sides until brown . Remove from pan and set aside. 2. In another pan, heat oil then saute garlic and onion.Add tomatoes then continue sauteing for 5 minutes or until soft. 3. Add vegetables and stir cook for a minute, then add water and simmer for 5 minutes. 5. Season with fish sauce and pepper according to taste. 6. 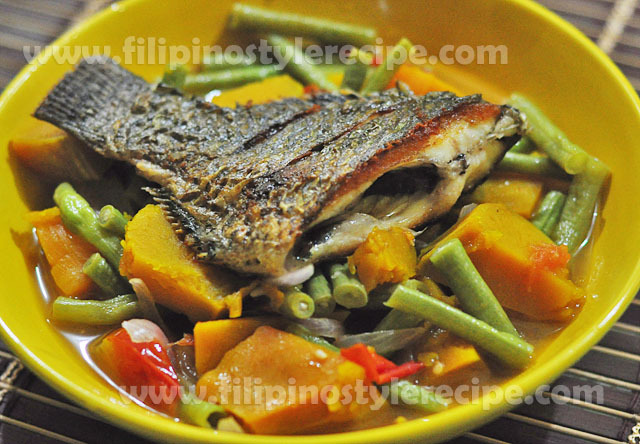 Cook until veggies are tender, add the fried tilapia and let it boil for 1 minute. Transfer to serving plate and serve. 1. Soak beans in water for 1-2 hours or overnight before boiling. 2. In a pot, boil water and add beans, simmer for 30 to 45 minutes or until beans is cooked. 1. In a saucepan, cook pork until color turns to light brown and start to render oil. 2. Add garlic, onions and tomatoes, saute until it’s cooked. 3. Pour in boiled beans, broth and pork cube. Season with salt and pepper. 4. Bring to boil and simmer until slightly thick. 5. Add ampalaya leaves and pork rind. Cover and remove from heat. Serve. 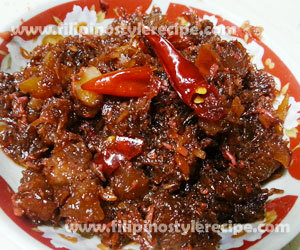 Filipino Style Recipe: Sauteed Shrimp Paste or Ginisang Bagoong Alamang is popular Filipino dip together with raw mango. 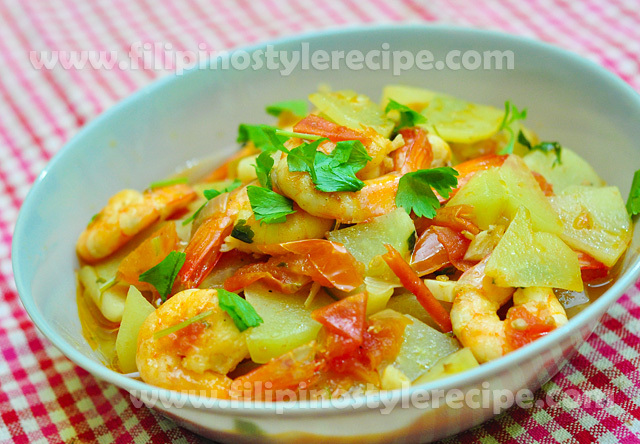 Filipino shrimp paste is made from fermented krill(alamang) sauteed in ginger, garlic, onion and tomatoes. This is commonly served as side dish or paired with mango, turnip, steamed spinach, etc. 1. Wash shrimp paste into running water then drain well. 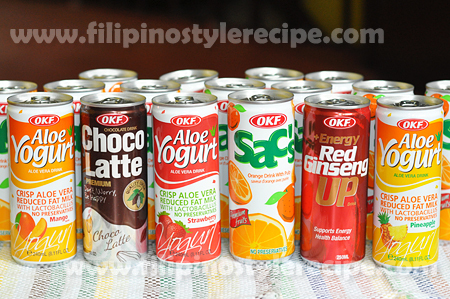 (This will help to reduce the saltiness of shrimp paste). 1. In a pan, stir cook pork fat until oil comes out then add pork meat and stir cook until golden brown. 2. Add ginger, garlic, onion, tomatoes then saute for 3 minutes. 3. Add shrimp paste, water, chili, vinegar and sugar then stir cook over low heat for 15 minutes. 4. Adjust seasoning according to taste. Remove from heat then serve as side dish or pair with raw mango. 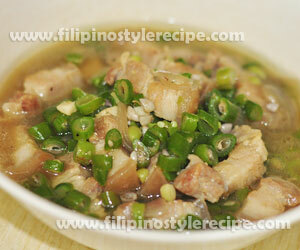 Filipino Style Recipe: Sauteed pork and green beans is an easy and affordable dish. 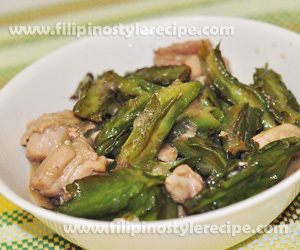 It is consist of pork and green beans(baguio beans) sauteed and cooked until tender. 1. In a pan, heat oil then saute garlic and onion until translucent. 2. Add pork and fish sauce then stir cook until light brown and tender. 3. Add green beans then stir cook for a minute. 4. Pour water then season with fish sauce and pepper then simmer for 3-5 minutes. 5. Transfer to serving bowl then serve with steamed rice. Enjoy! 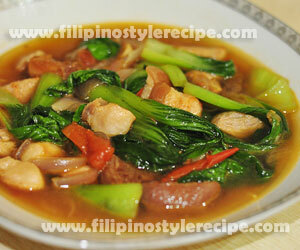 Filipino Style Recipe: Sauteed Chinese pechay(bok choy) is another healthy yet affordable dish. Normally the pork sauteed until tender then cooked and simmered with bok choy then season with fish sauce and pepper. 1. In a pan, heat oil then add pork and fish sauce. Stir cook until light brown then set aside. 2. In a same pan, saute garlic, onion and tomatoes until soft. 3. Put back pork then pour water and bring to boil then season with fish sauce and pepper. 4. Add bok choy then cook for 2-3 minutes or until half-done. 5. Remove from heat then serve with steamed rice. Enjoy. 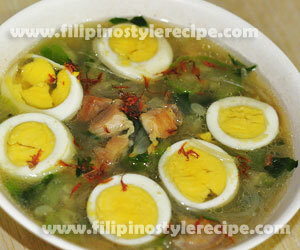 Filipino Style Recipe: Sotanghon soup with patola and egg is another noodle soup dish that usually serve during rainy season. The pork sauteed then cooked with patola and sotanghon noodles. Topped with egg slices and saffron before serve. 1. In a saucepan, heat oil then saute garlic and onion. 2. Add pork and fish sauce then cook until color turns to light brown. 3. Add water and pork broth cubes then simmer for 10 minutes or until the meat is tender. 4. Add patola and cook for 2 minutes then season with fish sauce and pepper. 6. Add sotanghon noodles and simmer for 1 minute. 7. Remove from heat then transfer to serving bowl. Top with sliced eggs and saffron. 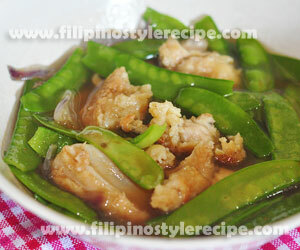 Filipino Style Recipe: Sauteed snow peas and chicken is easy, simple and affordable dish. Normally the chicken pieces coated in batter and fried until brown. The snow peas sauteed and cooked in stock together with chicken for a few minutes. This dish is affordable and easy to prepare which usually serve as side dish or during rainy season. 1. In a bowl, combine the chicken, egg, salt, ground pepper and then cornstarch. Stir to coat the chicken evenly. Let sit for 15 minutes. 1. In a frying pan, heat cooking oil and deep fry chicken for about 7 minutes or until color turns to golden brown. Drain and set aside. 2. Add snow peas and continue sauteing for a few seconds. 3. Add chicken stock and season with salt and pepper. 4. Bring to boil then add chicken and simmer for a minute. 5. Remove from heat then serve hot immediately. 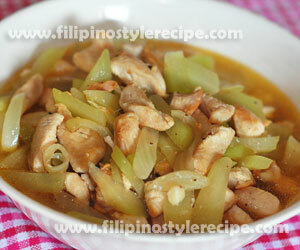 Filipino Style Recipe: Sauteed Chicken Chayote or ginisang manok at sayote is another easy and simple dish. Sauteed chicken chayote is affordable and simple yo prepare, the chicken sauteed and cooked with chayote until tender. This dish is usually serve during rainy season. 1. In a pan, saute garlic and onion. 2. Add chicken fillet, fish sauce and pepper then continue sauteing until light brown. 3. Add chayote then stir cook for a minute, pour water then cover and bring to boil. 4. Season with salt and pepper then simmer for 3-5 minutes or until tender. 5. Transfer to serving bowl then serve hot with steamed rice. 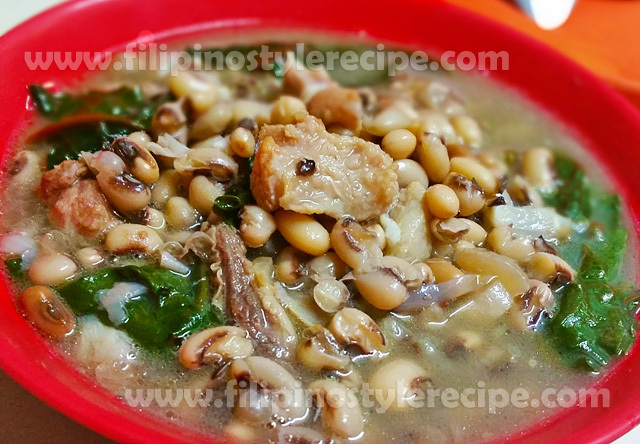 Filipino Style Recipe: ginisang sigarilyas or sauteed winged beans is another healthy yet affordable dish. The procedure is very easy and simple, normally the chicken or pork sauteed until brown then cook and simmer with winged beans until tender. 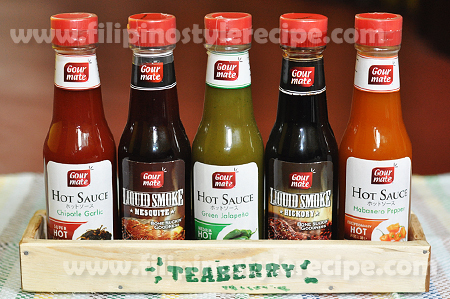 Season with bagoong na isda or fish sauce according taste then serve with rice. 2. Add chicken fillet and stir cook until brown then season with bagoong and pepper. 3. Pour water and bring to boil then add sigarilyas. 4. Cook for 3-5 minutes or until cook then adjust seasoning according to taste.